Toodeloo Kangaroo I’m off to visit Santa’s Pants. Now don’t get me wrong I’m not some crazy woman who converses with imaginary marsupials, nor do I have a fetish for the jolly mans jingle! No, I merely have the job of taking care of our Hemerocallis fields here at Woottens and I have recently been replanting some of these fantastically named varieties. Hemerocallis have got to be one of the easiest plants in the garden. They will grow anywhere, sun, shade, clay or sandy soil. In fact, stick a Hemerocallis plant in the ground, water it till established and then pretty much forget about it until it flowers. 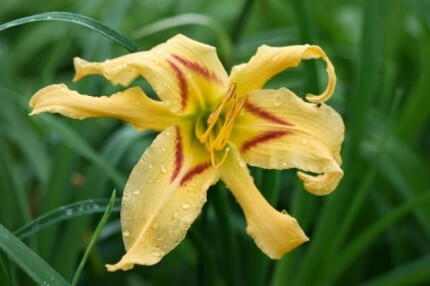 But if like me you’re always thinking about your plants and are willing to give them a little more love, even chat to them, then Hemerocallis are extremely easy to propagate. You can split them down to a single fan, chop the leaves and the roots back, and plant. Given a good balance of water and sunny days and those single fans can double or more in a season. The one thing they do benefit from is enough water before flowering which is why this spring has been fantastic for our Hemerocallis fields, and we should have a fantastic display this year. This leads me on to the common name for these wonderful plants, Daylilly. Now I have been growing Daylillys for nearly 10 years and you would be surprised at how many times I have received that funny look followed by “whats the point” when I tell people the common name “Daylilly” is because each flower only blooms for a day. Believe me there are enough stalks with enough flower buds on a good sized plant of Hemerocallis to have a lovely display in June/July and all without much effort, what more could you want! Well you may want to eat them, although I have not tried them myself, they are considered a perennial vegetable. Leaves, roots and flowers are all edible. So how about tucking in to a “Salmon Pagoda”, some “Chesapeake Crablegs” or serving a “Judge Roy Bean” salad at your next BBQ? You may just have your guests “Singing in the Sunshine”. Our Hemerocallis Fields will be opening this year from 28th June – 6th July.